When the lights go up at the Temple of Bacchus on Wednesday, and the orchestra of Assi El Helani sounds its first notes, a collective sigh of relief may well rise up through the warm Lebanese night air. The realisation of this year’s Baalbeck festival has been a feat of faith, grit and a not-insignificant military mobilisation. Since 1956, the imposing temple complex, lauded by Unesco as one of the world’s finest examples of imperial Roman architecture, has acted as a summertime performance venue for dance, theatre and music. But the ancient site has found itself a hostage to modern geopolitics. 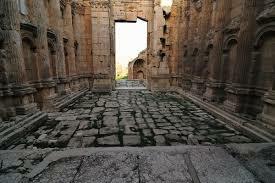 Baalbeck sits deep within Lebanon’s Bekaa Valley, a Hizbollah stronghold 11km from the Syrian border. The bloated refugee camps encircling the town make the short distance to the border feel even smaller. This year, bullish state patronage elevated the reseating of the festival to a question of national pride. “This is a project where everyone is concerned,” says de Freige, including, she lists, “the ministries of culture and tourism, the prime minister and the president – when we have one”. The army is putting troops on the roads into Baalbeck for the duration of the festival. Their reasoning is simple: as long as well-heeled Beirutis are willing to travel to the Bekaa Valley, the state is not failing. But Baalbeck is within the thick line of red shading that snakes along the Lebanese-Syrian border on UK Foreign Office maps and informs potential visitors that travel to the region is inadvisable. As a result, finding artists of the stature expected of the region’s oldest and most prestigious festival has become a delicate alchemy. De Freige explains that the committee has leaned increasingly on those with existing ties to Lebanon, something that is true of all five acts performing this August. Two are Lebanese: the singer-songwriter Tania Saleh and El Helani, a powerhouse of the folkloric genre. The others, Tunisian oud performer Dhafer Youssef and Romanian soprano Angela Gheorghiu, have performed in Lebanon before. The French actress Fanny Ardant, who will be acting opposite Gérard Depardieu in Marguerite Duras’ La Musica Deuxième, is herself a veteran of the Baalbeck stage. A sixth show – by acrobatic dance troupe Les 7 Doigts de la Main, whose manager is of Canadian-Lebanese descent – was cancelled last week, with the company citing security concerns.